I love Hotel Du Vin. I’ve never actually stayed there, but I’ve been here for luxurious afternoon tea (on more than one occasion) and more recently for their wonderful 4 course Sunday brunch. However, for some reason I cannot fathom, I hadn’t yet experienced dinner in the bistro. 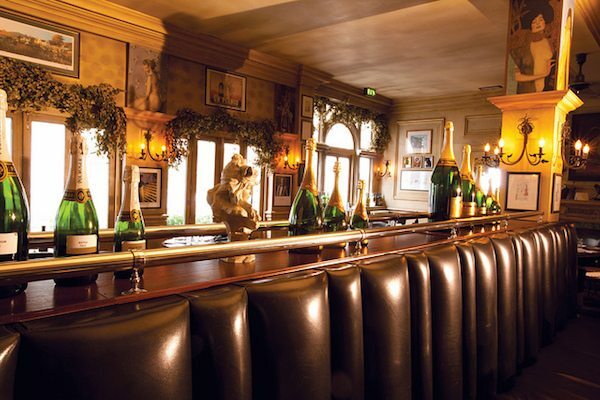 On the occasions I’ve enjoyed afternoon tea in the bar, I’ve always peered into the beautiful bistro wistfully and thought how lovely it would be to dine there. The decor just draws you in. There is a faux grapevine snaking across the base of the ceiling, reminding us of where we are (Bistro of Wine). Other wine featured artifacts are dotted around including rows and rows of your classic empty wine bottles, pretty paintings of wine and vineyards and even framed portraits of famous winemakers. The lighting is a perfect combination of natural daylight coming through the glass shutter doors and soft lighting from the real lit candles on the tables and faux candle lamps on the wall. The floors are beautiful reclaimed dark stained floorboards and the seating a sumptuous black leather. There’s a gorgeous cream fireplace to the left of the room with a huge painting above it of a couple sitting on what looks like Brighton seafront enjoying a glass of wine. As well as local touches like this, it’s french influence is also clear including ‘Parisian’ style paintings of beautiful, scantily clad women. This fusion of French and British works well. It is clear that a lot of thought was put into this room and for me, that’s important. As you would expect for a hotel restaurant we are greeted at the host stand by a waiter/host. He is very smiley and seems happy to see us despite the bistro being busy already on a Thursday evening. There was a subtle buzz in the room, and as I looked around all I could see were happy, relaxed faces. If the smell of the food was anything to go by, it wasn’t hard to understand why. We were given the choice of the a la carte menu or the shorter seasonal menu they’re currently offering called the ‘The great outdoors: Alfresco’. We liked the sound of this but I did wonder if that meant we actually needed to eat ‘outdoors’. Although their vine covered pergola terrace was beautiful, the cold and windy ‘May’ weather we were experiencing made it less desirable this evening. Thankfully our waiter reassured us (with a hint of a smile) that this wasn’t necessary. The alfresco menu is split into three courses: entrees, plats principaux and desserts. There are 5 entrees to choose from, all light and fresh featuring seasonal produce. We chose the ‘Soup Au Pistou’ and the ‘Pint of Prawns’. 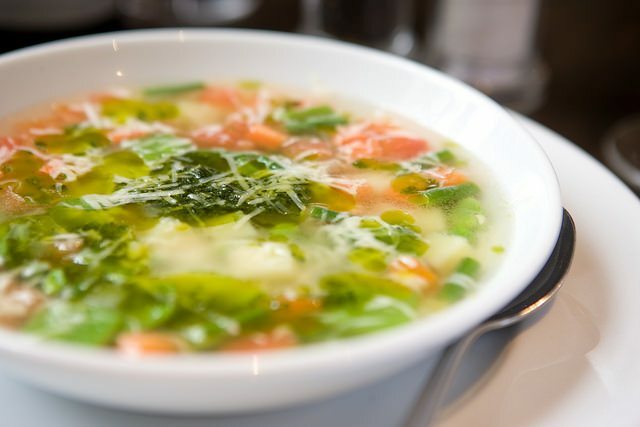 The soup is a fresh light minestrone soup garnished with homemade pistou. Pistou is not something I’d heard of before but I was told it is a Provençal cold sauce made from cloves of garlic, fresh basil, and olive oil. Somewhat similar to pesto, although without pine nuts. The soup came out absolutely steaming hot which is always a relief when you order soup as in my opinion if it’s less than steaming, it’s never as good (unless it’s gazpacho of course). It was lovely and brothy with an array of vibrant, fresh, crunchy vegetables. So refreshing and not at all ‘stodgy’ like some soup can be for a starter. The pistou gave it a lovely mediterranean flavour. The pint of prawns was literally that: ‘Eight succulent prawns served on crushed ice’ in a steel pint tankard. It was served with a half a lemon wrapped in mesh and a side of spicy cocktail dip. The prawns tasted cold, fresh and juicy. They were a decent size too. The al fresco menu even had an al fresco drinks page which covered ‘alfresco pitcher’s’, summer cocktails, ciders and fruit beer and a whole list dedicated to the lighter red, Pinot Noir. I wanted a white wine to go with my prawns but I couldn’t quite decide. The waiter was keen to offer his advice and recommendation so I asked him to choose. He seemed comfortable with this task and confidently chose a Californian chardonnay. It was absolutely delicious. Buttery, juicy and icy cold. Perfect with my equally cold and juicy prawns. My partner wanted a big red to go with the Hotel Du Vin Burger which he’d already set his heart on. Our waiter recommended the Malbec and by now, we trusted him implicitly. All the staff working around us give off an air of professionalism, confidence and trust. They are warm and genuine in their interactions with the guest but also work well together to ensure that guests have what they need and are happy. Throughout the evening we must have had at least 4 different staff members check on us and cater our every need. Very impressive service. The ‘plat principaux’ is a good selection of simple meat dishes, fish, vegetarian and salads. Having a healthy appetite and a love for food, I very rarely choose a salad for my main course, whatever the season. This is not because I don’t appreciate how tasty, versatile and refreshing salads can be but it’s because it never quite satisfies my belly (or more than likely my brain). However, the salad on this menu is so hearty and so robust I had a change of heart. The ‘Normandy Chicken Cob Salad’ was made up of roast chicken, roquefort cheese, avocado, sun blushed tomatoes, brioche croutons, soft boiled eggs and roasted pancetta. It sounded good to me. And it was. It was the heartiest salad I’d ever had, and full of taste and flavour. Everything tasted extremely fresh and of the highest quality. The Hotel Du Vin burger on my partners plate was equally hearty and robust and looked as appealing. The obviously handmade beef patty had been chargrilled as it had that lovely barbequed taste. The burger relish gave it an added lovely tang. The fries were handcut with the skin on and were crispy without being greasy. Finally desserts. Six to choose from again with a seasonal focus there was lots of fresh summer fruit. Rhubarb fool, tropical fruit pavlova and haygrove english strawberries. Simple, summery and sweet. Like any good dessert selection, there was also the more chocolatey option of the ‘Mousse Au Chocolat.’ Being chocoholics this one was hard to resist. We decided to be partly good and share. Thankfully, this wasn’t a decision we regretted as it was a large portion. Rich, creamy and decadent with fresh whipped cream on top to offset. My first experience of the Bistro Du Vin lived up to all expectations. The service is spectacular, the decor delightful and the food is a joy. It’s clear that they pride themselves on fresh, seasonal produce and providing dishes that everybody will enjoy. The Al fresco menu is another example of the thought they put into what they do. 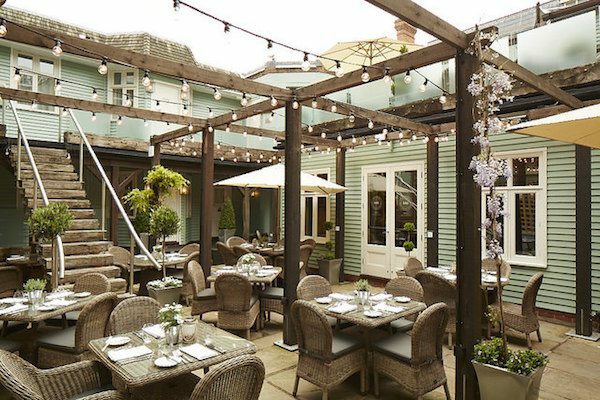 If you’re craving light, fresh and seasonal ingredients and want to get in the mood for summer (whatever the weather is doing) Bistro Du Vin is a good place to be.